This is your guide to artwork and how magical it can be in the world of interior design! At Amanda’s House of Elegance we love art in all its forms and want to help you curate an art collection that elevates your home from ordinary to magical. Imagine your artwork as the icing on the cake, once you have a good base you can add your personality and express yourself through decor and artwork. Wall art draws the eye, pulls a space together and makes your home inviting; and we are ready to tell you how! Select what you like! This is the biggest tip we could give to anyone buying art, you have to live with it and therefore you should love it! There are no rules for what art you should like, art should foster positive feelings of enjoyment, curiosity or relaxation. Pick what speaks to you! Use your walls for expression! 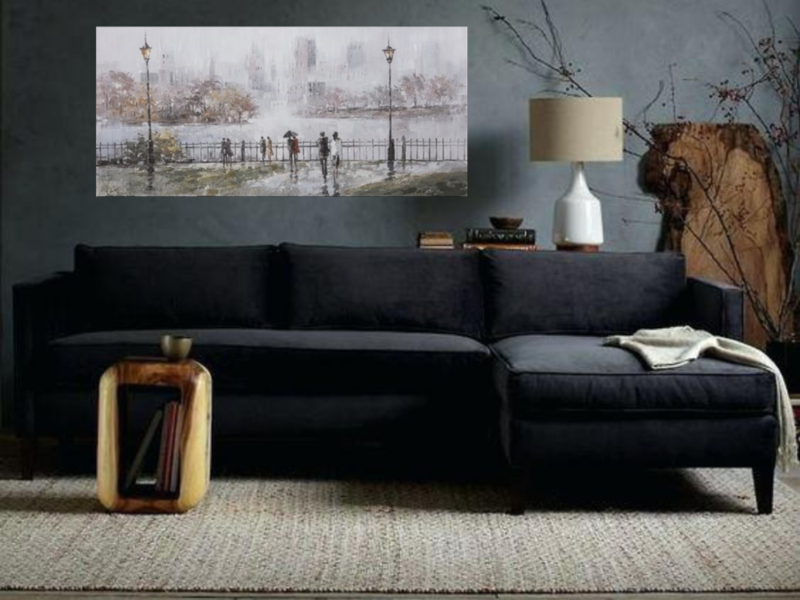 Maybe you are in a bit of a decor rut, or you played in safe in your furnishing when initially decorating; Now you can choose art to express your personality and style. 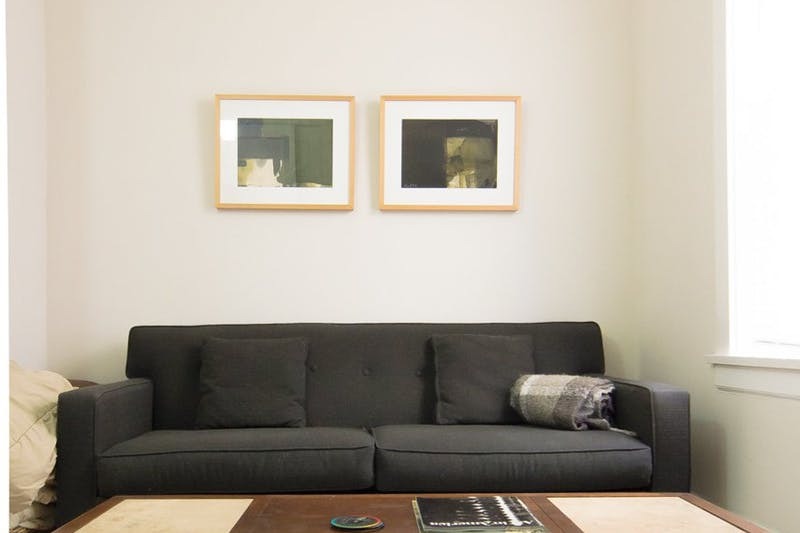 Art can be an investment, but their are great budget friendly options for every budget. So don’t be afraid to switch things up and get something new. Act fast, most artwork is one of a kind for a reason! If you love something, take the leap! Find a starting point! Whether its the artwork itself that you are designing a room around or you are trying to pick a piece for an existing room design, you need to find a starting point! This can be a style, colour, theme, or inspiration. So pick a point and start investigating your options. Scale, Scale, Scale! The size of your piece is one of the most important aspects to choosing art. You need to find a something that not only works style wise, but also in terms of dimensions and placement. A huge style mistake is leaving a small piece of art floating in the middle of a giant wall with nothing to ground it If a piece is too small, try pairing it with other art or photographs to bring a more cohesive look to your space. To go solo or to pair? Like indicated above, if something is too small a great way to remedy the situation is to pair it with other things. These things can be alike or in completely different genres. Try to find a common connection flowing through all pieces, try a colour or style. All the artwork in this post can currently be purchased at Amanda’s House of Elegance! We hope you find the perfect piece that fosters positive feelings and adds joy to your life. We love elegant and beautiful things at House of Elegance and would love for you to fall in love with something here! Keeping up with the newest design trends can be a hefty task to accomplish. Things are always changing and the trends seem almost too large to achieve in your home. To help you out, here is your guide to the biggest trends of 2019. 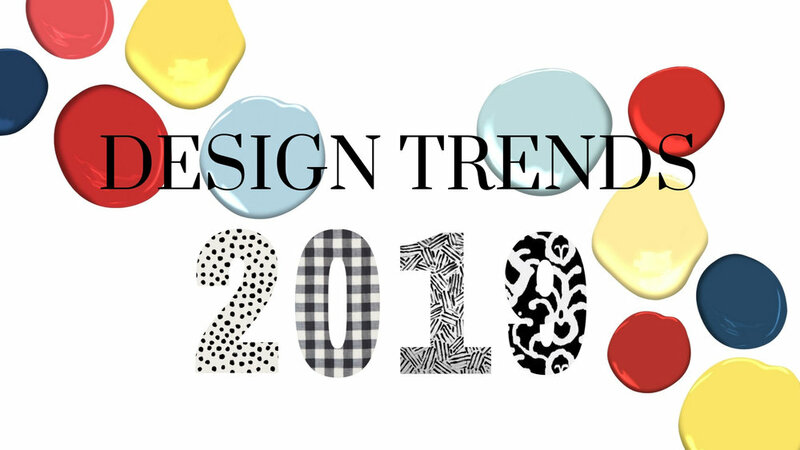 This is an inside look into what the design world is morphing into this year and how you can get your hands onto whats hot! Mixing pattern of any and all kinds is the new way to go! Rugs, fabrics and tiles in all styles and patterns are all approved and appreciated. This trend is all about being confident, don’t be afraid to test different items until you find a good mix. An easy way to ease into this trend is by incorporating different pillows into your space. At Amanda’s House of Elegance, we have a ton of styles that could easily be mixed and matches to create a beautiful aesthetic. Try pairing a large striped pillow and a pillow with a smaller floral or ikat print. This will create the effect without overwhelming you all at once. In 2019 we are going back to the primary’s, primary colours that is. Thats right, 2019 is all about blue, red and yellow! While these colours are certainly bold, they can be incorporated into any space with ease with these simple tips. Don’t forget about your hallways: Hallways can be a great place to infuse some serious colour. This is because they can stand almost on their own, you can treat them with their own identity! Don’t force a colour into a room where it obviously doesn’t belong. If you already have a room with a set colour scheme, this may not be the place for this trend. Add some bolder primary colours into room where the colour maybe already exists or if the room is already generally neutral. If you are a nervous Nancy about colour, try sticking to small accents at first versus a larger piece. This way if you decide its not for you you can change it out again! The front door way be a great place to start this colourful journey! A navy blue or bright red would be lovely door colours that truly make a pop. This trend is all about how to mix the feminine side of style and the masculine side. The masculine being leathers, dark metals, dark colours, and dark woods. The feminine being white and creams, linen, floral patterns and curvier shapes. While leather couches and dark wood furniture are nothing new, this trend is about finding the perfect balance between them to appeal to all preferences. Bring on all things curvy! Straight and streamlines are on the decline and 2019 is seeing lots of curvy furniture and more organic shapes. Not only are they beautiful to look at, they offer a manipulated perception of spatial awareness. Using this correctly means that there will appear to be a lot more space than there actually is, allowing for your home to feel larger! Let’s be honest, no one has ever wished for less space. Look for rounded accents to bring this trend to your home in 2019. Minimalism in on its way out and in the process is making room for maximalism! The phrase “more is more” is going to be in full swing and 2019 is bringing a surge of creativity in these busier room designs. Maximalism doesn’t just mean more stuff, because stuff is never the answer. This trend is about not being afraid to fill your space with patterns, texture, meaningful belongings, and life! Your space should feel lived in and welcoming compared to the clean lines and starkness of minimalism. Texture has been in style for the last couple of design seasons but it is gaining even more momentum in 2019. Mixed texture means combining many different materials and fabrics to create and overall fuller and warmer space. This means combining the rich (velvets, leathers), with the cozy (wool, linen, fur) and throwing in some highlights (mirror, glass, metals). Don’t be afraid to combine many different materials to create the depth that your space deserves. At Amanda’s House of Elegance we love a great rug! Bold rugs are on trend and we want to help you bring a beautiful rug into your home. The rug is not only a necessity, but it is also an easy way to update your space. There are three ways you can go with this trend, you can bring in a bold colour, or a bold pattern, or something that has a bit of both! At House of Elegance we can custom order a rug that will fill all your desires! Decorating for Christmas can be a little bit daunting but also very exciting. It’s a chance to change up some decor in your home and bring out some old holiday favourites. Plus everything looks more festive with some Christmas lights! So, whether you are a seasoned pro or still getting the hang of things, we hope these tips and tricks make your decorating adventure much more enjoyable. This goes for both inside and outside. The entrance or foyer is great real estate for expressing your style and bringing out all the stops. It’s the first impression of Christmas that your home makes on your guests and it can be the most fun to play around with because of the amount of space. Don’t be afraid to invest in some larger pieces to make a big impact. A great purchase from Amanda’s House of Elegance would be one of our large nutcrackers. For $798.95 each, these nutcrackers would be a great investment to be the showstopper at your door. This can really mean many things. Not only can you use a variety of materials around your home, but you can use different colours and themes to add interest and something a little unexpected. An all white theme in the home is lovely, but why not throw in some champagne to jazz things up a bit. Besides, a little sparkle never hurt anyone around the Christmas season. Do you have lots of greenery leftover from trimming your tree? Put extra tree boughs down the centre of your table to create a unique centrepiece. I don’t mean keep your decor simple, because as I’ve said before it is great to pull out all the stops around the holidays. Though there are ways you can make your life easier and less cluttered when decorating. For example, when purchasing lights, if you know the lights will be in an inconvenient location it may be smart to purchase battery powered lights to avoid cords hanging or being brought across a room to an outlet. Though you must keep in mind that people had have to eat there! The dining room is a great space to enhance because it creates a lovely environment for one of the biggest meals of the year. While we encourage you to decorate to your hearts content, if people will be eating at the table regularly maybe keep it simpler so that nothing needs to be moved when setting the table. Again such great real estate for decor. Remember to decorate both the mantle and the ground in front of the fireplace, as the fireplace is often the focal point of a room it’s important to dress it up. Candles and floral sprays are a great way to achieve this. There is really no need to take away your everyday decor for the holidays. To simplify your life, just add decor to add Christmas spirt to your home. Adding red fruit like cranberries and pomegranates to your fruit bowl instead of the usual bananas and oranges, or adding some twinkly lights to your staircase are easy ways to add and not have to subtract any decor making it easier for you in the long run. If you haven’t been into Amanda’s House of Elegance recently, you must head in. It is a full on Christmas wonderland and is sure to get you into the Christmas spirit. We are sure many of you are starting to think about decorating for Christmas and we are here to help! Not only do we have a plethora of elegant Christmas options for every room in your home, we have lots of tips and tricks to turn your space into a Christmas wonderland as well. Here are our favourite do’s and don’ts for the season. Do you hate clutter? Stick to decorating the mantel and banisters on your stairwell to get a huge impact without cluttering your home. These locations add instant Christmas appeal without making your home feel crowded or cluttered. If you have small children or pets, these locations also are out of reach for the smaller occupants of the home. Use seasonal elements to allow your decor to last longer! By incorporating decor that is winter themed versus Christmas themed, you can start decorating earlier and leave your decor up longer. We all love Christmas decor, and are not telling you to skip the Christmas theme, but having a mixture of both will do you better in the long run. Be thoughtful an deliberate. By putting thought into all the spaces in your home, you will end up loving your decor for the happiest season of the year. Start thinking about your decor early and give yourself some time to wrap your head around colours and styles you like. Use lots of lights! Lights are the easiest way to get big impact on Christmas. Incorporate twinkly lights and candles into your decor and you are sure to end up with a beautiful Christmas display. Personalize your space. Don’t feel pressured to stick to one idea of Christmas, Decorate with whatever speaks to you. We love seeing personalized Christmas displays, this is also a great way to incorporate some of your kids and loved ones pieces into the home. Don’t limit yourself to red and green. Christmas is a time for lots of colour to be incorporated and we want you to get inventive. We love seeing blues, golds, whites and silvers in all kinds of Christmas decor but truly any colour can be incorporated into your home. Your current home decor can be a great jumping off point for your holiday decor. Don’t expect things to be perfect. Perfection is not possible, and this is a don’t for all things holiday related, not just decor. Give yourself some time to relax and enjoy the holidays! Don’t shy away from the classics. Who doesn’t love a garland and some poinsettias? While Christmas is a great season for experimenting with decorations, we love the tested and true classics that fill your home with those warm and fuzzy feelings. Don’t overcrowd. Sometimes the simpler, the better. Take your time deciding what areas of your home should be busier than others, but don’t feel the need to add space filling decor to all areas. We have so much more holiday content to come in the next couple of months! Happy Holidays and let the fun begin. There is no reason for your halloween decor to be any less elegant or fabulous then you decor for any other holiday or season! We love halloween, and know it can be done in an elegant and upscale way so that you are wowing all October long! Here are a few of our favourite tips and tricks for how to step up your halloween game for 2018! Here is a handy dandy chart for all your pumpkin needs! All orange, round, jack-o-lantern pumpkins are for the past and we are all for it. Here are a few of our favourite pumpkins to add some fun and whimsy to your halloween decor. We LOVE this idea! At Amanda’s House of Elegance we have a ton of long tampered candles so that you can get this look in your own home. As an alternative, we think that candles and lanterns in any form bring in the Halloween feelings to any room. Come down to the store to pick up some WoodWick candles and view some of our beautiful lanterns. If there is any holiday to bring out the black it is Halloween! We love the dark and moody presence some intense hits of black give to a room, it is sure to add some boldness to your decor. And if you want spooky, black is the way to go. Dim the lights and let the mood take your guests to another world for the night. Have some fun with a monochromatic scheme! We love all white scenes with pumpkins and flowers. While it may not be the spookiest of decor, it is sure to make a statement all on its own. We still have a few beautiful wreaths in Amanda’s House of Elegance that you can purchase for your home! We love wreaths with notes of both autumn and halloween so it fits in the whole month long. Wreaths are a great way to add some fun to your door while staying classy and sophisticated, and there are just so many great options you are sure to find something! Less than two weeks till the big day! Happy Halloween! With fall colours and temperature fast approaching, for better or worse, Amanda’s House of Elegance is ready to solve all of your fall decor needs! We suggest slowly transitioning your home’s decor to including fall colours and pieces that match the changing exterior. Come down to House of Elegance to fall in love with autumn once again! If we had to assign a colour to the seasons, autumn would definitely be gold. Everywhere you look in the fall season you see warm hues of reds, oranges and gold’s. It is not a secret that gold in very on trend and at House of Elegance we are very on the gold train for injecting some autumn decor into your space. A gold touch here and there will add warmth and light to your home and we would love to show you how. Let’s be honest, there is nothing better then being outdoors in the autumn season. All of the leaves changing colours and the crisp, clean skies during the day, some may call it magical. Bring this feeling into your home by bringing in the colours of the changing leaves, greenery, and natural woods and stone. The feeling that fall brings needs to be brought inside and this can be easily achieved through your choice of decor. Perhaps a natural wood tray to display some festive pieces, or natural stone candle holders would truly bring the outside in. And by adding “spice” I mean adding warmth to your space! The best way to do this is through warm candles and scents throughout your home. At Amanda’s House of Elegance, we love WoodWick candles for so many reasons. Not only are they made in a variety of fall approved colours and scents such as autumn, pumpkin pecan and warm wool (even the names provoke feelings of fall! ), their wicks crackle as they burn bringing a fireplace feel into any room. While natural pumpkins themselves can be beautiful as a decor element, since we are only halfway through September, it may be a tad too early to invest in the real thing. Pumpkins are a true symbol of fall, and we think they can be used in an elegant way all through the autumn season. At Amanda’s House of Elegance we have some great alternative to the tradition Halloween pumpkin that are both elegant and that will inject some fall into your home. There is nothing better then cozying up in the fall with a big chunky blanket and some beautiful pillows. Now that September is here and the temperatures outside will be slowly dropping, its time to replace your cottons and linen’s with wools and luxurious velvet fabrics. Pick out prints that highlight the colour tones in your house and also inspire warmth in your home. Plaids and rich hued florals are great for autumn. At House of Elegance, we love bright and beautiful floral arrangements especially when paired in one of our stunning vases. Now that the colours and temperature of the season is changing, its time to change up those flowers and add in richer hues and fall flowers to the mix. We love adding in fall foliage, sprays that add colour and texture and some greenery to tie it all together. If you've ever had a room hovering at "almost there," you know how frustrating of a situation it can be. The room doesn't look bad, it just doesn't quite sing. It's missing something, and you can't put your finger on it. You might find these six things to try helpful when a room just isn't coming together like you thought it would! Whether you tried to copy a room you saw on Pinterest piece by piece, have always just wanted a room that feels like Kelly Wearstler designed it or looked to a piece of art for color palette inspiration, go back to that inspiration and compare. What do you have in your room that's not in the inspiration? What don't you have? It might be a case of you trying an extra element that's fighting the harmony of the original inspiration, or you may have forgotten to include a vital element that makes your inspiration work. Take out a big element. Yes, even something big like curtains. Now step back and look at the room again. Even if the room feels a little emptier, you might be able to see the potential of where the design needs to go. You might not be able to see what your room is missing because there's something that doesn't belongin there already, blocking your ability to see the room's potential. Why do you feel like that spot is working? What is it that you love? Take what's working and spread it out around the room a little more. Maybe it's a color you only used a touch of that could be maximized more in the space. Maybe it's a style of furniture you played around with on a small scale that the room could use more of. See what adding more of what you love in the room does to the feel of it. Grab something from another part of the home, from a friend's home or find a free thing — just make it something that seems surprising to add to the space. As we've mentioned before, sometimes bringing something that you think obviously doesn't go can produce one of two equally favorable outcomes: either it surprises the heck out of you by working in the space, or it points you in the right direction to go in by being so mismatched! And then leave the room you're trying to figure out. Like, go to a coffee shop or somewhere else. Look at the photos you took on your phone and scroll through them. Look at the photos on a small scale; small thumbnails that let you see the whole space. Put some mental distance between the fact that this is a room you live in and see every day and instead view it like a room you'd be spotting on a blog somewhere. And then immediately listen to your gut on what you think the room might need (or need taken out). Those pictures you took earlier? Print them out if you can (or turn to a digital photo manipulating tool) and start doodling. Drawing patterns. Drawing furniture pieces. Squares where you think more art could go. Doodle stuff you wouldn't do in your right mind with actual items. That you can't do financially. Play. And when you hit on something that feels like it clicks, figure out how to make it work on your budget and in your space! Every well design home needs well curated accents in order to successfully execute the desired look. While the bones of the design are often large pieces such as rugs and furniture, the best way to outfit your space is through smaller accents such as pillows and throw. Pillows can be changed up depending on the season or occasion; they can also be an easy way to change up the look of the room on a small budget. We love pillows at Amanda's House of Elegance. Here are our favourite pillow and throw combinations currently available in store right in the heart of downtown Kingston. We can't wait for you to add new life and design to your couches, beds and chairs. A very classic set of pillows, but they will add new life to any space. The gorgeous grey large scale gingham is a modern take on a classic design. We love this pair because of the contrast between the muted tones and the bold patterns. Beautiful neutral pillows with bold and interesting prints and patterns can be a great choice for many homes. This over scale bird print is a great whimsical way to add some interest to any room while the cowhide pillow add some elegance and glam. This combination is the perfect mix of pattern, neutral and colour. The variation between the three pieces combined beautifully to create depth and interest. Every room needs a little shimmer and shine. This beaded quatrefoil pillow is a subtle bit of sparkle, but when light hits the beading it will create a large impact. This metallic printed pillow is the perfect pair. Green is the perfect colour to add some life and energy to your space. We love subtle greens that lean more towards neutrals in a space and these pillows are the perfect example of this. The stripes and floral balance each other out perfectly. This is definitely the most eclectic of the pairings we came up with. All three pieces have bold prints but they are all working together to create a mixed-match look that is eclectic and fun. Coral/orange and navy pair beautifully but are an uncommon pair which adds a unique touch. Let's talk materials. I am personally addicted to soft, dreamy, beautiful fabrics and materials. Whether I am picking out the perfect pillow for my bed, choosing a soft, cozy blanket to cuddle up with, or even choosing out my favourite winter sweater, the first thing to do it pick the item up and feel the texture, quality and weight of the fabric. I also love the rainbow that is cast across my room when the light hits the crystal lamp on my bedside table. The beauty is in the details. There is just something about cotton that feels and is luxurious. Honestly when I think of cotton I automatically think of some of my favourite tops to wear particularly in the summer. Let's change this! Cotton is a fabulous material to use in the home. While polyester has its place, cotton and other high quality materials are something to get excited about! One of the best parts of the day in my opinion is right after you get out of the shower and are feeling clean and relaxed after using luxurious products for you hair and skin. Why let it stop there? Exquisite Turkish cotton towels let the good time keep going. Head into Amanda's House of Elegance to feel the spa like material for yourself! Beading is a simple way to add beauty and sparkle to any space. The delicate touch needed for a beaded product is proof of the quality and high end materials. Any beaded piece is sure to wow your guests. Embroidery is an art. It is completed by using a needle to thread yarn or string through another fabric. The results are breathtaking. Through embroidery you can get precise and detailed patterns and designs. A pleat is a style staple and though it is a classic design, many modern products are putting pleats in a modern context. Pleats add interest and style to any fabric. The defining feature of a velvet pillow or item is it's signature soft feeling and texture. Velvet is a woven, tufted fabric which often comes in vibrant and beautiful colours. Pattern is a key feature of design that every room needs a little bit of. From florals, to chevron and all pattern in between you cannot go wrong with a couple of patterns pillows or throws. This sort of seam is a beautiful finish to any fabric. Its rounded edge provides a very clean profile. The French seam is a very common choice for higher quality and designer pillows. It is a stunning finishing that provides high impact because it adds length and fullness to the pillow itself. The French seam gives a particularly elegant profile. The plain seam is also very commonly used on upholstery and pillows. It is a very simple and easy seam to accomplish and gives a clean profile to the material. This is also very common on removable pillow cases because it makes it easy to hide any zippers or fasteners. The key to staging a house properly is allowing the buyer to be able to see themselves in the house. This translates into keeping paint, decor, and furnishings neutral and easily changeable. There is a fine line between "boring" and "neutral" when it comes to decorating and home staging. These go-to neutrals with subtle shades will be anything but boring when executed in your home. Here are 16 neutrals to help sell your house. A blue or green based neutral paint colours is a subtle way to add a calm and refreshing light to a room. These colours are cool and dreamy and are a great way to add interest without being too bold. White is an instant classic to add to your home. White paint colours are classic, bright and clean. 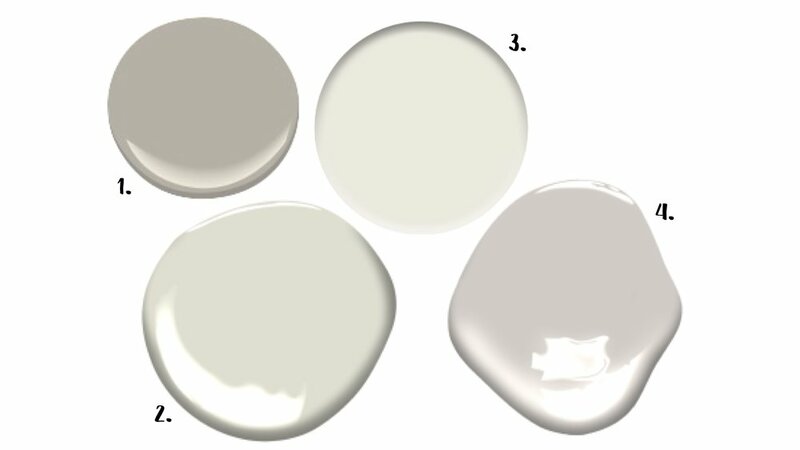 While a large number of neutral paint colours can appear to be white or "off white", these colours have a brighter base and will appear as a crisp white in a room. Pure white is a simple way to add simplicity to a space. Light pink and pale purple toned paints are a softer and more feminine way to add neutrality to your home. These paint colours add a coziness and gentle feel to your walls. They are warmer tones which can be beneficial when painting large spaces with larges windows and lots of natural light. The most classic and versatile neutral is the grey or beige toned neutral. These colours are timeless and sophisticated and can be a great jumping off point for any colour palette. Designers and homeowners often jump to these colours because of the neutrality they offer compared to other tones. To find decor and accents to suit the style of your space come into Amanda's House of Elegance.